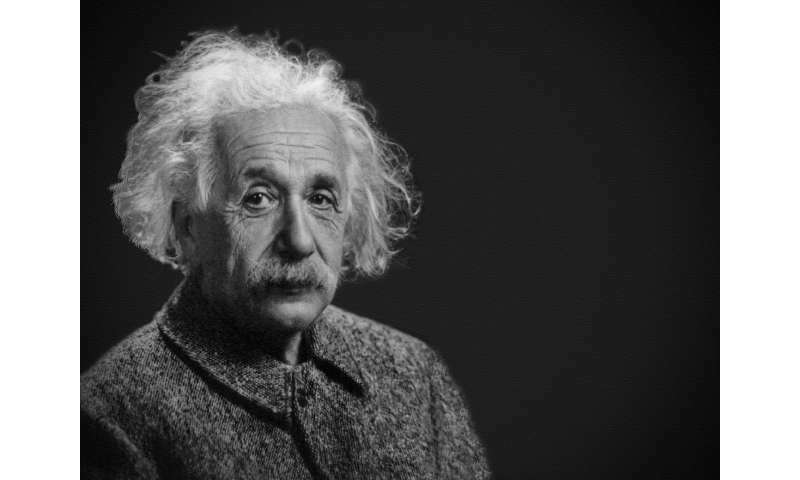 The perception of having Albert Einstein's body may help unlock previously inaccessible mental resources, finds a new study. Following a virtual reality "Einstein" experience, participants were less likely to unconsciously stereotype older people while those with low self-esteem scored better on cognitive tests. Published in Frontiers in Psychology, the study suggests the way our brain perceives our body is surprisingly flexible. The researchers hope the technique will be useful for education. "Virtual reality can create the illusion of a virtual body to substitute your own, which is called virtual embodiment," says Professor Mel Slater of the University of Barcelona. "In an immersive virtual environment, participants can see this new body reflected in a mirror and it exactly matches their movements, helping to create a powerful illusion that the virtual body is their own." "We wondered whether virtual embodiment could affect cognition," says Slater. "If we gave someone a recognizable body that represents supreme intelligence, such as that of Albert Einstein, would they perform better on a cognitive task than people given a normal body?" Bias is based on considering someone to be different from yourself. Being in an older body may have subtly changed the participants' attitudes by blurring the distinction between elderly people and themselves. Similarly, being in the body of someone extremely intelligent may have caused the participants to think about themselves differently, allowing them to unlock mental resources that they don't normally access. To further investigate the phenomenon, a larger study with more participants—and including men and women—is needed. However, the results so far suggest that the technique could be useful in education. "It is possible that this technique might help people with low self-esteem to perform better in cognitive tasks and it could be useful in education," says Slater. How the hell do they know what an "Einstein" body feels like? People that see themselves as another Einstein invariably have delusional arrogance. It can be seen from these posts that typically they don't understand the first think about physics but have the delusion that they understand all of it and better than Einstein. I wouldn't want anything to be done here to foster more such delusion people. Mount a laser at the end of a hollow perfectly rigid tube 1 light year long, on earth Turn it on and at the same time rotate the tube for 8 minutes. The observation will be that the laser light will have gone 93,000,000 miles, or the distance to the sun, while the opposite end of the tube would have rotated 1 light year at the opposite end of the tube, at the same time. Einstein's Light is rather slow in this analogy, that advanced civilizations offer, in their way of travel thru the Universe, way beyond Earth capability. The rigid tube is condensed into a space faring vehicle, and time and space are quite different than Earthians interpret them. When we read a book or watch a film, there is a tendency to identify with a character, to share the life experiences of that character. This identification is the an extension of the extrapolation capabilities of the mind. Identification with our flow of memories and thoughts gives rise to a sense of self. And this identification is the root of what the author calls visual embodiment. Exposed to enough stimuli, we all can identify with what we perceive as a new persona. Regarding Einstein above, the projection of Einstein's body caused people to identify with what they perceived as what "being Einstein" meant. For someone who was familiar with his intellect, that person would likely feel more intellectually confident. For someone who was not familiar with Einstein, that person would likely be affected by the appearance of the body. The experimenters simply redirected the brain's tendency to "identify a self." The test of implicit bias might be a bit flawed since they didn't set a control for how much time they were allowed to mull over whatever the implicit bias questions were... I mean, the group that experienced normal bodies may act as a control for that, but they're trying to control for something else with the same group. And maybe it doesn't even have to do with "embodiment" so much as simply *seeing* an elderly person before being asked those questions. You seem to be onto something there. The trick to instant travel is to nullify time.